Here's a few highlights from the final research expedition for the reptile & amphibian animal tracks field guide project. 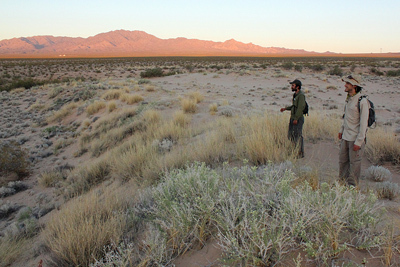 During late June and early July Alderleaf Wilderenss College instructors Filip and Jeremy, along with Alderleaf Wilderness Certification Program graduate Ted, traveled throughout the southwest of the United States collecting data for the up and coming book. The destinations included field sites in California, Arizona, New Mexico and Utah. The trip was an incredible journey over many miles and through some of the harshest wilderness areas in North America. This was the final major data gathering trip for the book and was incredibly successful! 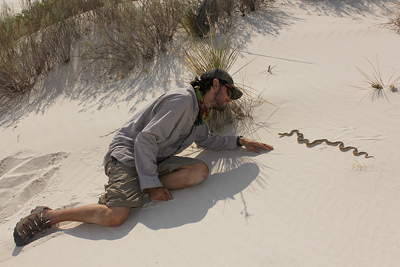 Here are some of the photographic highlights from this herpetological wildlife tracking expedition. Here Ted and Jeremy are enjoying the setting sun on some desert dune habitat at the end of our first official day of field work. 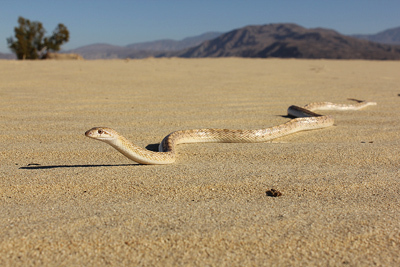 A beautiful arid-land species, the glossy snake (Arizona elegans). This incredibly smooth and beautiful animal is more active at night and uses its pointed snout for digging up prey. 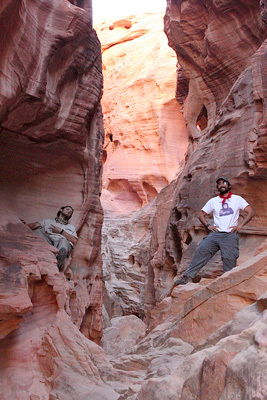 Here is the research team at another site, in a beautiful sandstone canyon. On this particular day, it hit about 110 degrees and so we sought the shelter of a deep, and cool canyon during the midday high temperatures. We re-emerged just like many of our reptiles subjects, when the afternoon temperatures dropped back into the 90's. 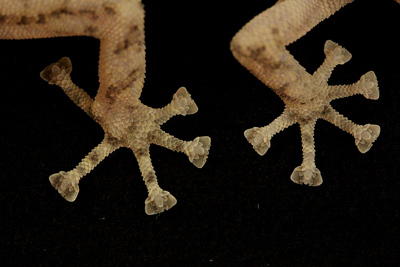 These amazing feet belong to a peninsular leaf-toed gecko (Phyllodactylus nocticolus). This animal was photographed in captivity during a visit to the San Diego Natural History Museum. 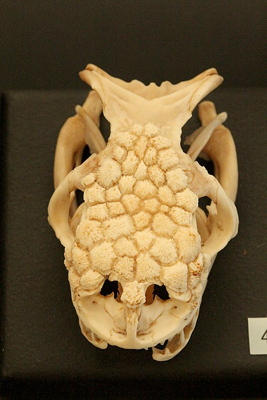 The amazingly specialized skull of a red diamond rattlesnake (Crotalus ruber) observed at the San Diego Natural History Museum. 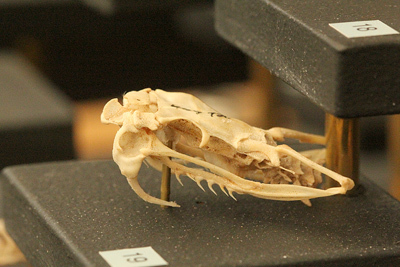 The amazing, dragon-like skull of a Gila Monster (Heloderma suspectum) at the San Diego Natural History Museum. In a canyon in Arizona we came across the perfect animal tracks belonging to a Gila Monster (Heloderma suspectum) . These are so clear that if you look close, you can see the scale impressions from the bottom of its feet! 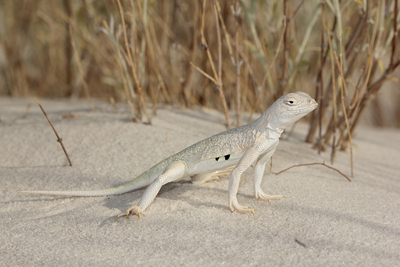 This beautiful animal is a specially-adapted species that lives in the pure, snow-white sand dunes in New Mexico called the bleached earless lizard (Holbrookia maculata ruthveni). Here Ted and a wild snake have a close look at each other. Like most wild animals, when approached slowly and with respect, snakes are often very calm. Summer weather in the southwest deserts can be unpredictable. 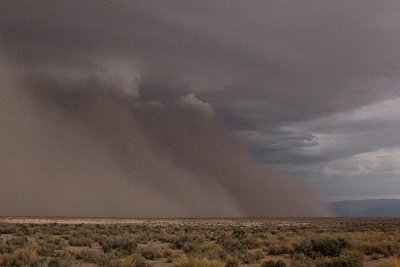 Here you can see the intimidating edge of a sand storm rushing ahead of a large, approaching thunderstorm. 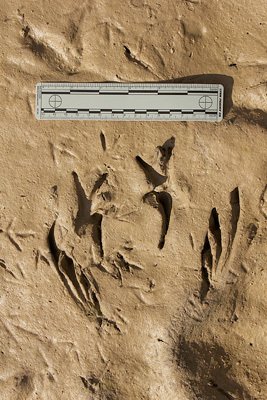 These are amazing animal tracks, and belong to a huge bullfrog (Lithobates catesbeianus). They were made in the mud along a pond edge in New Mexico. This frog was likely around 7 inches long! The southwestern landscapes were sometimes breath-taking in their majesty. 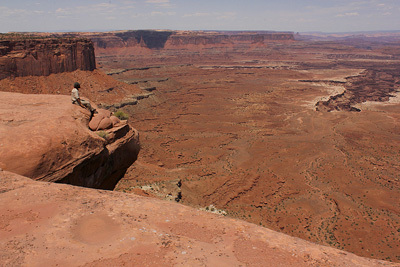 Here Jeremy contemplates the vast, deep chasm of Canyonlands National Park. Interested in learning about tracking? 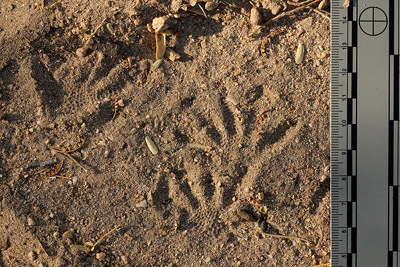 Check out our Wildlife Tracking Courses and animal tracks & sign articles.